More than 1,000 Marion County young people have a better understanding of contemporary agriculture, thanks to their participation in a special program sponsored by the local Farm Bureau. 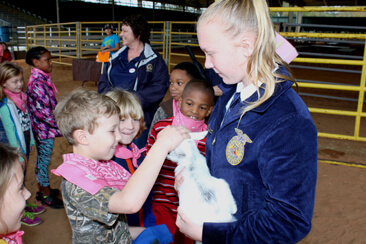 The Ag Ventures program, held Feb. 22-24 at the Southeastern Livestock Pavilion in Ocala, hosted second graders at 12 different learning and demonstration stations. Marion County Farm Bureau volunteers and middle and high school FFA students served as presenters on behalf of the production of various commodities, such as citrus, blueberries, poultry and beef cattle. She added that 80 FFA students participated in the three-day event. Some of the presenters handed out samples of fresh foods; others demonstrated their hands-on, excellent care of farm animals. Organizers provided an experience that would inspire the young visitors, in addition to educating them. “Hopefully, the kids can say, ‘I want to do that when I get older,’” LeFils said.